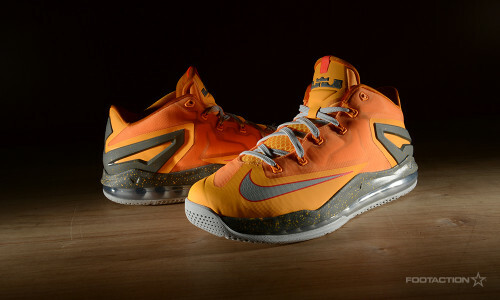 The Nike Max LeBron 11 Low ‘Atomic Mango’ is decked out in vibrant shades of orange, while featuring a vibrant kumquat base, accents of light base grey and a dark speckled midsole. Along with a colorway that aligns perfectly for a “Floridian” summer, the materials are complementary: light and breathable thanks to its mix of mesh and sold Hyperfuse paneling. With King James in the NBA Finals at the moment, the regularly-scheduled LeBron releases will have even more eyes on them. Releases in stores and online Saturday. Check out Release Locator for stores. Print article This entry was posted by hhcblog on June 10, 2014 at 9:16 pm, and is filed under Footwear. Follow any responses to this post through RSS 2.0. You can leave a response or trackback from your own site.